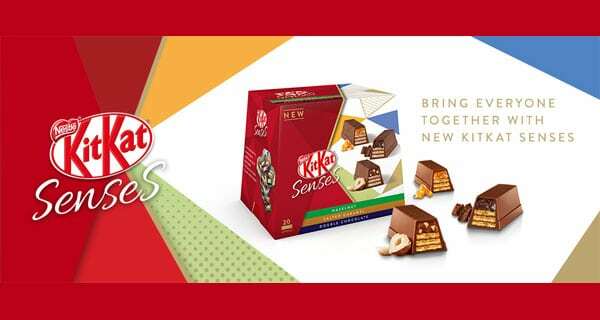 KitKat fans in the UK and Ireland will soon have a new way to enjoy confectionery as Nestlé has launched KitKat Senses, indulgent KitKat chocolates in three new, luxurious flavours: hazelnut, double chocolate and salted caramel. KitKat Senses is a box of individually-wrapped bite-size chocolates, each with the combination of delicious KitKat chocolate and wafer and either a layer of indulgent praline and crunchy pieces of hazelnut (hazelnut), salted caramel filling infused with crunchy caramel flakes (salted caramel) or rich chocolate ganache and crunchy cocoa nibs (double chocolate). The launch of a more indulgent KitKat product is a big innovation for Nestlé confectionery in 2018 and follows the introduction of premium brand, Les Recettes De L’Atelier last month. It has been a busy start of the year for KitKat. Back in January, Barry Callebaut and Nestlé partnered together for a world first and launched a Ruby chocolate version of KitKat, named KitKat Chocolatory Sublime Ruby. You can read our article on it here.